In 2000 by the SMM Paleontology Dept. 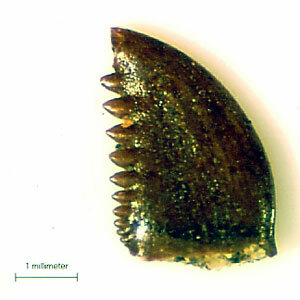 This 5mm long tooth from the Science Museum of Minnesota's dinosaur collections belongs to Troodon, a small theropod (2-legged, carnivorous or meat-eating dinosaur) from the late Cretaceous in Wyoming. This image was made with the Paleontology Department's CCD digital camera/microscope (right).